You can change your scents at any time on your account page, which you'll have access to after signing up. Please note: In order to receive your new scents, please change them BEFORE your soap-scription renews. There is an email reminder that will be sent out 24 hours before your soap-scription renews. 1.) 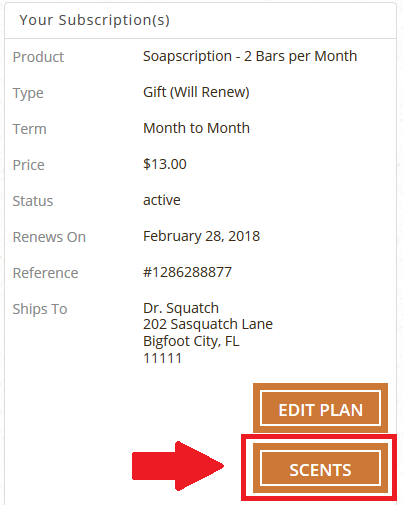 Log in to your account at drsquatch.com: 2.) Select "My Account" at the top of our homepage: 3.) Select "Scents" featured on the right-hand side of your account page: 4.) Select the "-" (minus) symbol featured beside the bar that you would no longer like to receive: 5.) Select the "+"(add) symbol featured beside the bar that you would like to have included with your next renewal order: 6.) When you are satisfied with your selections, select the "Update" button featured at the bottom-right of your scent page: 7.) If you do not select the "Update" button featured at the bottom-right of the page, your new scent selections will not be saved.